StephanieGrant was getting comfortable living on the streets of the Mission. It was Spring 2016, and she had recently fallen in love with a man she would see in her tent encampment on Folsom Street. They moved around the streets of the Mission together, and in April found themselves on 18th and Shotwell streets. On April 7, encampment resident Luis Gongora Pat was shot and killed by police. Grant and her partner, a man named John Visor, were immediately thrown into the spotlight as eyewitnesses of the police killing. Visor was among the first to contradict police accounts of the fatal shooting of his close friend. Police said Gongora Pat had been wielding a large knife when officers responded to the scene, and that Gongora Pat charged at them with the knife after officers shot him with a beanbag round. But Visor said, throughout the incident, the knife had been tucked into Gongora Pat’s waistband, facing down, and he did not charge at officers before they shot at him seven times. Both Visor and Grant appeared on cable news reports following the incident, and both were planning to testify as witnesses in a civil trial brought by the family of Gongora Pat against the City of San Francisco, which is will begin in October 2018. But now only Grant plans to testify. On Friday, Aug. 11, Visor was found dead in his residence at the Mission Hotel on 16th and South Van Ness streets. The San Francisco Medical Examiner, those close to Visor say, ruled his death a suicide. It came at a time when most thought Visor and Grant were getting their lives together. Being in the limelight also helped them find services. Grant said her and Visor’s lives changed for the better following — and perhaps because of — the horrific incident. “When Luis Gongora passed away, it encouraged us to do better,” said Grant. Looking back, Grant said it’s hard to believe how comfortable she was getting on the streets by the time Gongora Pat was killed. She said she would carry weapons, including a piece of rebar, as protection. She didn’t at all mind how she looked on the television cameras after the shooting. She wanted to get off the street, but she didn’t know how to go about it. “You really get sucked in,” she said. “But [the shooting] showed me that I don’t want to live like that anymore,” she added. Following the Gongora Pat killing, the couple alleged that police had begun to harass them. Indeed, Mission Local reported that on the Saturday following the shooting, police raided the encampment on Shotwell where Visor and Grant had been staying — and where Gongora Pat had lived before he was killed — and threatened them with arrest if they did not leave. Grant, Visor, and a group of homeless advocates felt the street was too unsafe for the outspoken witnesses, and raised money to move them off the street. Grant and Visor first stayed in the Civic Center Hotel downtown, and then moved to the Travelodge on Valencia and McCoppin streets. Afterwards, Grant and Visor moved between shelters and the streets. On May 10 of this year, Grant, who was living at the Navigation Center on Mission with Visor, gave birth to her son. The Navigation Center doesn’t allow children, so Grant lived for a short time at Epiphany Center. In the meantime, Visor found housing at the Mission Hotel — and that is where he was found dead on Aug. 11. 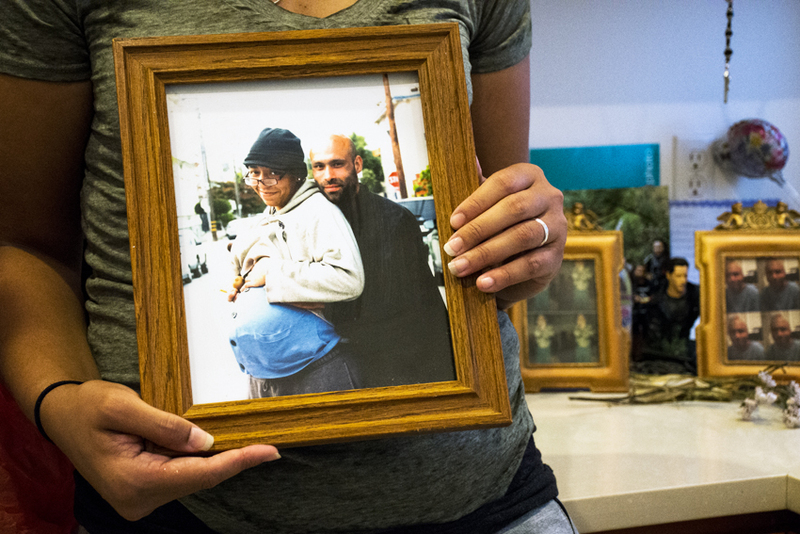 Stephanie Grant holds her young son at her Mission District residence. Outside the Mission Hotel on a recent Friday, residents remembered Visor as a withdrawn man of few words — but one who was always willing to lend a helping hand. Grant now lives with her son in a small Mission District studio. She’s been sober for more than a year and said she regularly tells her story at Narcotics Anonymous meetings at the Women’s Building on 18th Street. She said she’s participating in movements like Black Lives Matter, and plans to testify at the Gongora Pat trial next year. But Grant still wishes Visor was at her side. “I’m so hurt that John isn’t here to feel it with me,” she said. Many people who were close to Visor, especially those who helped him and Grant find housing after the Gongora Pat shooting, reject the idea he would have killed himself. Shyhyene Brown, who said she dated Visor for several years and who maintained contact with him until his death, said she saw him three days before he was found dead. Out of everyone, Grant was in the most disbelief. She said she had spoken on the phone with Visor several days before he was found dead. They had talked about plans for the weekend, including shopping for furniture for Grant’s new apartment. Visor also talked about buying diapers for Grant’s then-15-month-old child. Adante Pointer, a civil rights attorney at the John Burris Law Offices, visited the room where Visor was found dead with Grant and Gray-Garcia shortly after Visor’s death. Pointer said the rope was still in the room, and that it was at a height at which Visor could have easily stood up, had it been around his neck. Pointer said that Visor was important to the trial as an eyewitness, and they are investigating his death. Aside from the suspicion, nobody in denial of Visor’s suicide could say exactly who would want to kill Visor — or why. Meanwhile, Visor’s ashes are still at the morgue, and Grant has been struggling with the costs of his burial.